There’s something about biting into a succulent cabbage leaf that’s been stuffed with goodness and boiled in garlicky tomato sauce that just cannot be beat. Try this vegetarian version and we bet you won’t be missing the meat one bit! This weeknight-friendly, easy-to-whip-up dinner can also be made a day or two ahead – it keeps well in the fridge and makes a great healthy treat to pack for lunches. Sun-dried tomatoes add flavorful zip, while the onion and spices add savory depth to this dish. 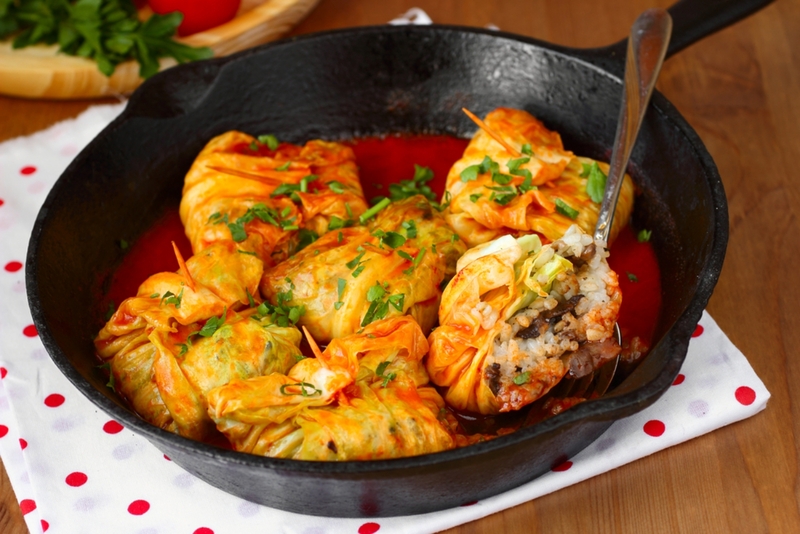 We’ve never met a stuffed cabbage we didn’t like, and these puppies are no exception! We love this meal! Place a large pot of water on high heat and bring to a boil. Reduce to a simmer, then place cabbage leaves inside and cook for 4-5 minutes, or until soft. Transfer flattened cabbage leaves to a plate, set aside and discard water. Place a large pan on medium heat, add onion and bay leaf and cook until onion is transparent. Stir in sundried tomatoes, half of garlic, cumin and thyme, cover and let cook for 6-8 minutes. Remove from heat and set aside. Add olive oil and remaining garlic to a heavy skillet on medium heat, and and cook briefly, until fragrant. Stir in tomato sauce and reduce heat to low. Simmer for 10-15 minutes, until sauce begins to thicken. While sauce thickens, fill each cabbage leaf with 1 tablespoon rice and 1 tablespoon filling, then leaving 1 inch of cabbage exposed around the edges, fold the sides over and roll up each stuffed cabbage leaf. Add each stuffed leaf to thickened tomato sauce, seam side down (or insert a toothpick to keep leaves closed), and spoon sauce over each one. Cover and cook for 10-15 minutes. Garnish with parsley and serve hot!